In the eleventh hour of the eleventh day of the eleventh month of 1918 — one hundred years ago today — the guns fell silent. Of course, it wasn’t that, not at all, and the toll of its carnage was staggering: more than nine million dead, more than 21 million wounded2 — and that’s only the combat numbers. When you add in all causes of death, that war took the lives of somewhere between 5.2 and 6.4 million troops on the Allied side and 3.4 to 4.4 million troops from the Central Powers. It was — as all wars are — a terrible war. And so, today, November 11th — Veterans Day11 — The Legal Genealogist joins those who pause to thank every man and woman who has ever served this nation, wearing the uniform of its military services. 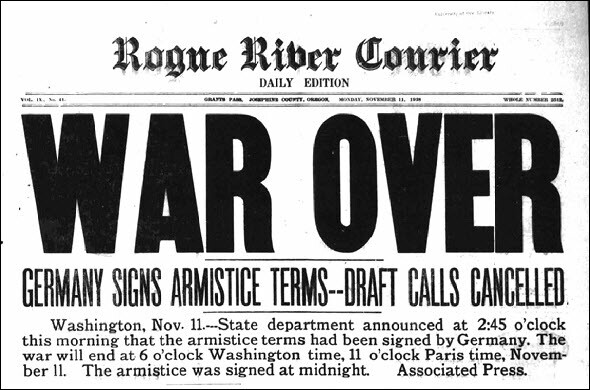 Image: “War Is Over,” Rogue River (Ore.) Courier, 11 Nov 1918, p.1; digital images, Chronicling America: Historic American Newspapers, Library of Congress (https://chroniclingamerica.loc.gov/ : accessed 11 Nov 2018).